The fuel for the 300% industry-wide increase in mobile data usage in the last two years is video and audio streaming. Studies show 65% of business data consumption is streaming and data use is projected to quadruple by the year 2021. If companies don’t get a handle on this expense challenge, mobile budgets are expected to experience a growth rate of 20-30% a year. Enterprises who assign corporate-owned devices need to become more aggressive in identifying, understanding then controlling the data consumption of its employees. Click here to learn how we can help you monitor and control your mobile data usage. According to Cisco, wireless and mobile devices will account for 71 percent of total IP traffic by 2022. And that’s not all they are predicting. * Mobile data traffic will increase sevenfold between 2017 and 2022. This magnitude of projected mobile data growth will not happen without significant cost ramifications. Not only will data be consumed at a significantly higher rate, but the carrier costs will increase per GB used. Contact MobilSense today. 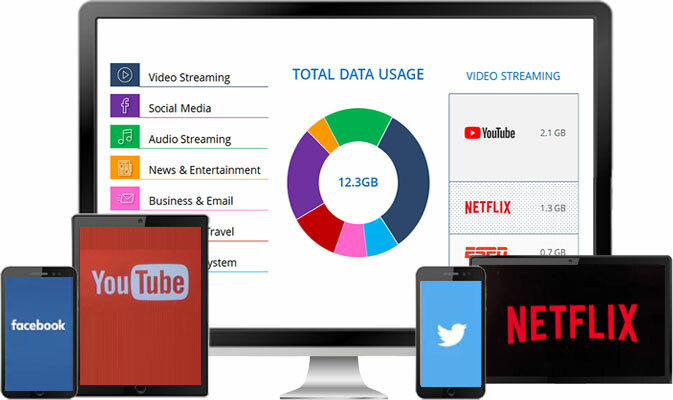 We can help you gain control over your data usage today so that you can avoid a potential “sevenfold” cost increase in 2022.